I’m not sure what, specifically, this book is really about – either that or I’ve been beat over the head with a “message.” Lydia Lee, a teenage girl from a bi-racial family, goes missing and is found dead in a boat in the pond. Her brother suspects the neighbor boy who was “courting” Lydia had something to do with it. Suicide is the main direction the narrative suggests as the reason for the death. But the majority of the narrative and the themes are not about a suicide or possible crime. Actually the death and investigation feels like a 21st century frame although the most contemporary parts take place in the 1970s. And to this Ng has attached a few main themes – the difficulties of a bi-racial marriage in the 1950s and bi-racial children in the 1960s, women’s roles and realities vs their dreams between the 1950s and the 1970s, the dreams some parents try to push on their children in all times, sibling love and “roles,” and the all-purpose 21st century theme of (ta-da) “memory.” No matter what you read on the blurbs – this is not a “thriller” in any sense of the word – it may be a mystery for a while. So the disappearance and death of Lydia Lee take place some time in the late 1970s, and then reader is taken back in time to the lives and memories of the victim’s parents, Marilyn, a caucasian homemaker, and James Lee, her professor husband of Chinese immigrant descent. James was Marilyn’s professor and now, in his sorrow, he’s having an affair with another student from his department. Marilyn is a frustrated medical researcher who has been stuck in in the traditional wife role of a marriage. But she had dreams and pushes for better things for her own daughter. James had a difficult childhood with few friends, so he pushes his daughter for better things. Meanwhile, Nathan is very bright and does well but his accomplishments are ignored while Hannah is a rather unknown quantity and neglected. On the plus side the character are well drawn and Ng writes very nicely so if you like to read these kinds of relationship dramas then I would disregard my rating – it may quite easily be a matter of taste – there are plenty of great reviews out there. One more thing, Campbell, the reader, has a soft breathy voice, regularly dropping the last word of each sentence making a fall-asleep pattern. The book may be better in a print edition. 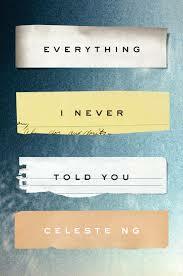 I liked this book much more than you did. I’d rate it a 9, and I had no problem with the reader at all. I liked how it was about how we don’t tell each other things. Maybe you should lay off reading for a while. Watch movies or television, or do something completely different. Yes, you can think of it as a lack of self-examination, but since I don’t tell people so much of what goes on in my head, I related to that aspect. And I do a lot of self-examination. It’s been a while since I read Everything I Never Told You, but I remember how each character was blocked in different ways from confessing what was going inside their souls. In recent years, I’ve been more forthcoming, and sometimes I think I shock people. I don’t think people like to reveal themselves. I was on a walk with one woman friend yesterday, and she asked about another woman friend of mine, a lady who is not my wife, but one I confessed just how much I enjoyed this woman’s presence whenever I was around her. My walking companion said, “I can’t believe you admitted that.” I asked her why she said that. I got the feeling she doesn’t expect men to admit such feelings. I jokingly replied, “Are you calling me unmanly?” I think the characters in the book didn’t confess their feelings because they were afraid of being considered various kinds of weak. I doubt I’ll lay off reading – lol – As I said in my review, these types of books are not my usual fare. I mostly like non-fiction and crime books. I think I’m in a bad mood because also, none of the narrators are passing my inspections – (omg). I’m just being a grump. I might check into my favorite narrators – I’ve got Dead Wake (Eric Larson) downloading now.